Eggplant is a common ingredient in Greek cuisine and is cooked in several different ways. 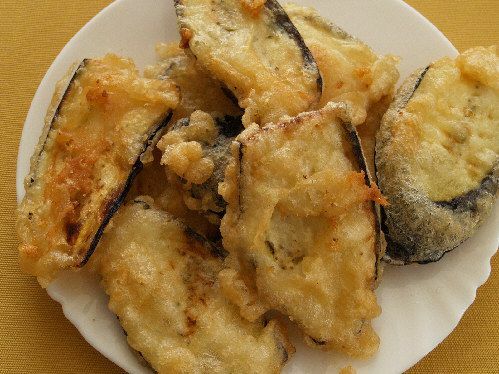 In this recipe for batter-fried eggplant (in Greek: μελιτζάνες τηγανητές, pronounced meh-leed-ZAH-nes tee-ghah-nee-TES), slices of the vegetable are coated in a thick batter and then deep-fried until golden and crispy—ideal as a side dish, or an appetizer (or meze) with a cucumber yogurt sauce on the side for dipping. Eggplant is notorious for absorbing as much olive oil as possible, so this recipe, which calls for quick frying in hot oil, is a good choice since the eggplant doesn't have enough time to get soggy. Use a cheese slicer, mandoline, or long-bladed knife to get uniformly thin slices. One of the ingredients is soda water, which helps to create a batter that puffs up when fried—the bubbles in the water create pockets of air that expand in heat, resulting in a light texture. Put eggplant slices in a bowl, cover with the 1 1/2 teaspoons salt, and let sit 20 to 25 minutes. A liquid will accumulate at the bottom of the bowl—pour this off before dipping eggplant in the batter. To make the batter, pour the soda water into a bowl, and stir in flour and salt slowly, using a whisk or fork to mix. Bring oil to high heat in a large pot. Coat eggplant in the batter, and using a fork, place pieces in the oil and fry 5 to 6 minutes, until golden on both sides and batter puffs up. Drain on absorbent paper toweling just long enough to remove excess oil. Serve hot.